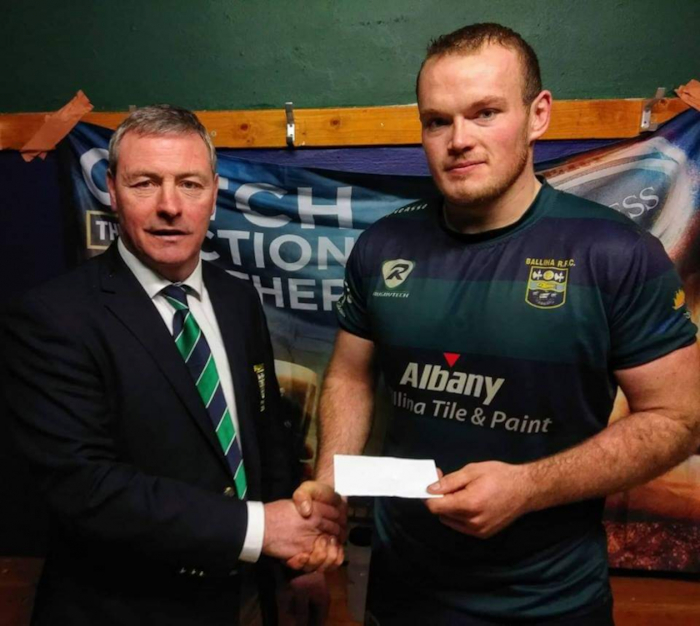 Shane Clarke was awarded the Guinness Man of the Man accolade at the end of Ballina's win over Midleton in Heffernan Park last Saturday. Ballina moved to the top of the standings in division 2C of the All Ireland League last Saturday following their victory over Midleton in Heffernan Park. The north Mayo men had nine points to spare over their visitors who made the long trip up from Cork for this top of the table clash - the victory put Ballina top of the pile in the league with six wins from seven games and leaves them two points clear of Bruff in second spot and saw their vanquished opponents drop to third place the highly competitive division. Ballina nudged themselves into a 6-0 lead early on through two penalties from Kieran Lindsay (who ended the day with 19 points from his boot ) - before the visitors got back into the game with Bryan Moore scoring the first try of the afternoon, which was converted by Stuart Lee to put the visitors a point in front. They then went on to more than double their lead when Rian Hogan touched down and Lee added the extras to leave the score at 14-6 to the visitors. However Ballina were not for breaking and they responded through a Daniel Molloy try, which Lindsay converted to leave just a single point between the sides at the break, with the scoreboard just favouring the visitors. Linddsay and Lee kicked two penalties each to keep things moving in the second half, before Ballina struck for home with a Lindsay drop-goal putting them back in front, before Darragh Whyte touched down for Ballina's second try, which Lindsay converted to seal a memorable win and sent Ballina top of the table. The north Mayo men will be back in action this weekend when the face a Bangor side who sit in fifth place in the table and eight points behind them at home at 2.30pm on Saturday afternoon.